It is only now, as time is so precious, that I truly appreciate the wonder that is a damn good book. Whether it’s fiction, an autobiography, self-help, whatever your preferences, sometimes nothing beats getting lost in literature. Above is my pile of reading material for the rest of 2014 (in reality I know I’ll probably only get through two or three, though I’m halfway through a couple already). I’ve always been interested in Buddhism and the Dalai Lama Autobiography has been truly captivating. Compassion seems to be the ongoing theme, he discusses transforming oneself, transforming the world, our common humanity and many other fascinating issues, but more than anything he offers hope to all of mankind. – Never a bad thing! It’s heavy going at times and I found myself having to re-read paragraphs to get my head around some of the complex terminology. – I think I picked up the underlying messages. The man is undoubtedly a hero and this book is a must read for anyone at all interested in spirituality. 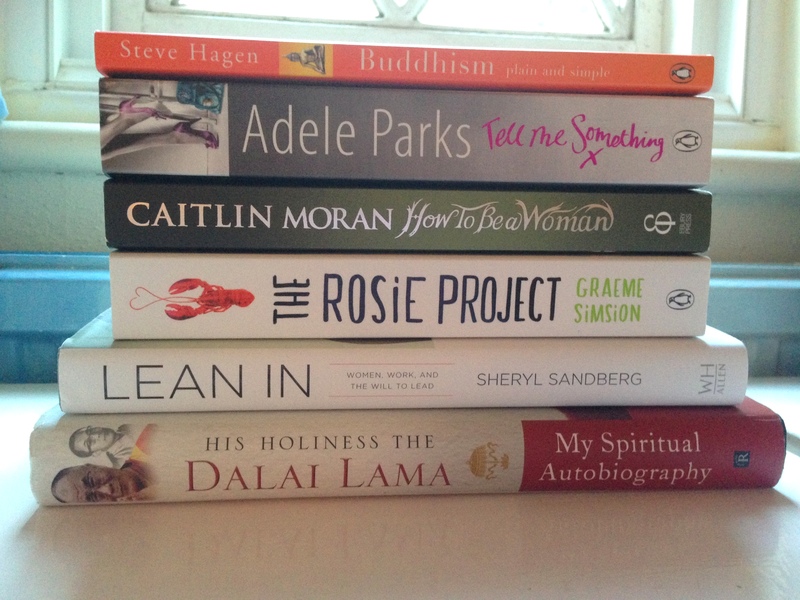 So what’s on your reading list for the rest of the year? Posted in A COLOURFUL LIFE and tagged books, happy, home, issues, lifestyle, literature, motherhood, personal, thoughts, women. Bookmark the permalink. I really enjoyed The Rosie Project, which was a welcome relief after the heavy The Goldfinch. What an awesome choice of books! You’ve given me the motivation I’ve needed to get back into reading! I also enjoy learning about Buddhism. I actually took a class in college and we read the book that’s on your reading list. Hope you enjoy it! I’ve just started and get a sense of calm just reading it.. It’s such an interesting religion!